Alright, I have done it! 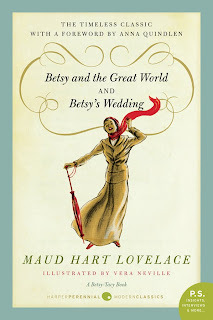 I have completely read through the Betsy-Tacy books by Maud Hart Lovelace, thanks to Sarah at Library Hospital. When someone (in this case, Sarah) can't quit harping on a book or series, it really makes a person who hasn't yet read those books feel like they are missing something. That's the way that Sarah made me feel and so last year, during her Maud Hart Lovelace Challenge, I read through the first half of these books. Her reading challenge is now underway and I've completed reading the Betsy books. It definitely feels good! There will be certain spoilers here. Nothing monumental but if you don't want to know what happens in each book, just ignore me for a moment and go read the stories for yourself. In my last review, I left off with Betsy & Joe who were developing their relationship. It was fresh and exciting! So it was with some great amount of INSANE disappointment that I cracked open Betsy and the Great World , and discovered that Betsy had botched things with Joe in a moment of extreme lack of consciousness and understanding, and was off exploring the Great World all by her lonesome. This, of course, is a recipe for disaster for any female who is ready and willing to lose her heart to guys at a moment's notice. Which Betsy is and does with some enormous amount of annoying regularity. But. To be fair, there is a certain element of Anne and Gilbert about this book. It has an Anne of the Island flair to it. You just have to suffer through the book until Anne Betsy comes to her senses and realizes what a ninny she's been. So anyhow, I was pretty ticked with Betsy for a few days while I read through this one and I was glad to have her finally set things back in order at the end. Side note: This is why I like to read series by dead authors. I can't fathom the agony of having to wait a millennium for the next installment to come out. Can you imagine having to wait for Lovelace to fix what she broke?!!? I moved on to Betsy's Wedding feeling a little miffed. But my ruffled and riled feathers were on their way back down because Betsy and Joe were on the mend and finally tied the knot. This book is all about their early married life. They find an apartment, they buy their first house, they hang out with friends and generally just spend their time really getting to know one another. I suppose it's an accurate portrayal of most early marriages. Actually, this story is based on Maud's own marriage to her husband, Delos. It's a perfectly believable story and they interact with one another and struggle through their early existence in perfectly believable ways. That to say, I don't really take any issue with Betsy and Joe and I'm glad to hear how their story concludes (from the perspective of the series at any rate.) I just didn't end up loving them dearly. BUT! I AM very grateful to have read the books. I think they are artfully written in that they send you on a complete whirlwind of highs and lows. No matter what you feel towards Betsy at any given moment, you keep rooting for her and reading on. I think that's the mark of a good, quality series. So there you have it. My opinion. Just one of many. Ta da! The end! I skipped this review...though I suspect no huge spoilers (since I read far enough to see she botched things with Joe...though I know he is a character in the last book), I wanted to wait and find out myself. Just last night I finished Heaven to Betsy! I did enjoy it! I'm planning on starting the series this weekend during the Readathon. How far I get just depends on how much I like it! I've never read these. At least I don't think I have. Maybe one day I'll read them with Ellie. Oh, wait a minute...I seem to have missed the part where you are giving away the complete Betsy-Tacy series. You have my email---You can just notify me when I win! LOL! You have my curiosity piqued about these books, so now I plan to hunt them down. I checked my library and they only have two of the titles. You've also got me trying to remember what my hubby and I were like as newlyweds. I think we were probably the slightly irritating, introverted, totally-focused-on-us kind. Fortunately, we've gotten over that. I mean it has been almost 16 years! However, if you track with Sarah @ Library Hospital, she IS hosting several MHL giveaways during the month of her reading challenge. I was just joking! You have done such a good job of piquing my interest, that's all! Oh. Ok! =D I couldn't tell. Anyway - Sarah IS giving away some of the books during the challenge so keep an eye out! Carrie, glad to hear your thoughts. I admit I was bummed to find you didn't love these books as much as I did. But then, although I love the Anne books I don't feel as passionately about them as you do. I guess it's just one of those "each to their own" personality/taste things. I am sorry you hated Betsy and the Great World so much. I know it's not a favorite of mine, but I remember reading it knowing things HAD to work out so I was just going to enjoy the ride. Betsy's Wedding is my favorite book, but I think it's because it's based so much on her real life with her husband. It just seems more real. Maybe it's just the phase of life I am in now - married. Thanks for putting a plug in for the reading challenge. I'm reposting links to my reviews to give an update for newcomers as to why I love the books so much. I have been hearing a lot about this author lately! I will need to go and check these out! Thanks!